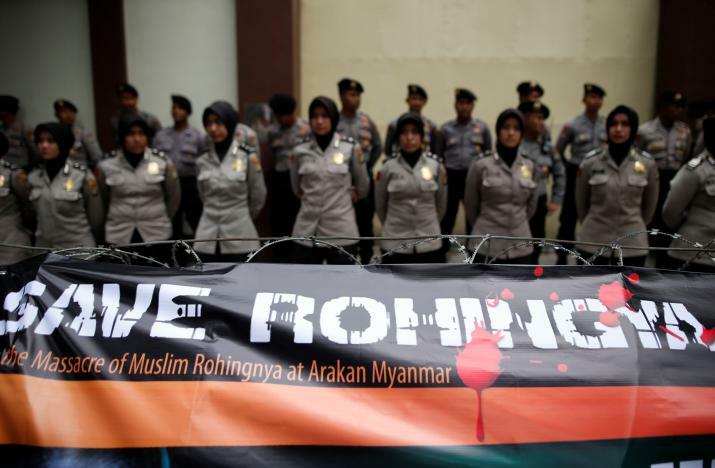 Malaysia will summon Myanmar's ambassador over the crackdown on Rohingya Muslims in northwestern Rakhine state, its foreign ministry said on Friday, as hundreds of protesters across Southeast Asia demonstrated against the escalating violence. The conflict in Rakhine has sent hundreds of Rohingya Muslims fleeing to neighboring Bangladesh and poses a serious challenge to leader Aung San Suu Kyi, who swept to power last year on promises of national reconciliation. At least 86 people are reported to have been killed in escalating violence that has displaced about 30,000 in the region's most serious bloodshed since hundreds were killed in communal clashes in 2012. The Malaysian foreign ministry called on all parties involved to refrain from actions that could aggravate the situation. "Malaysia also calls on the government of Myanmar to take all the necessary actions to address the alleged ethnic cleansing in the northern Rakhine State," it said in a statement. "The ministry will summon the ambassador of Myanmar to convey the government of Malaysia’s concern over this issue," it added, without giving a timeframe. Hundreds of Rohingya Muslims marched in the Malaysian capital of Kuala Lumpur, condemning the bloody crackdown on the persecuted minority and slamming Nobel Peace Prize winner Suu Kyi for her inaction. Protesters demanded humanitarian aid for Rakhine, and urged that the military seize all attackers. "The Myanmar government says the claims are all fabricated but they are not fabricated," Rohingya community leader Muhammed Noor told reporters, referring to reports of incidents of killing, rapes of wives and daughters and home burnings. "This movement has to continue, to pressure the government to stop the killing." This week, Muslim-majority Malaysia it was considering pulling out from a regional soccer tournament co-hosted by Myanmar in protest against the crackdown. But it later decided to continue. Protests were also held simultaneously in Bangkok, the capital of neighboring Thailand, and in the Indonesian capital of Jakarta. Protesters in Jakarta called for the Nobel panel to cancel its award to Suu Kyi. Indonesia is "ready and willing" to help Myanmar initiate dialogue, its foreign minister, Retno Marsudi, said this week. Many among the Buddhist majority in Myanmar view its 1.1 million Rohingya as illegal immigrants from Bangladesh.